The audio guide of the Mercantile Museum of Bozen accompanies visitors through one of the most important historical buildings in the town of Bozen. This audio guide offers different options for going round the museum in a simple and intuitive manner: the complete tour, the short tour or the customised tour. Thanks to NFC technology, visitors to the museum only need hold their smartphones in front of the relevant NFC chip and, in no time, can discover which works of art are on display in the room and gain direct access the relevant exhibits and audio files. Every station is linked to an audio file and every room is linked to the room plan to allow easy orientation. The original music ‘La pace di Mercurio’ and the voices of professional narrators make a trip to the museum with this guide a memorable experience. 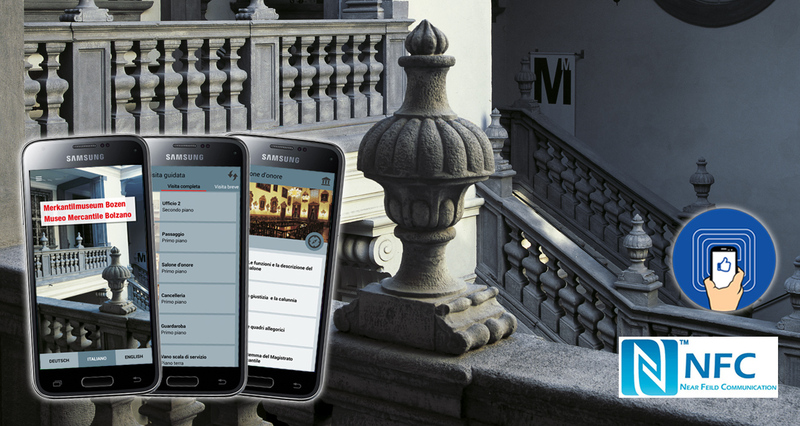 This app was created for the Mercantile Museum of Bozen. This user-friendly audio guide app is the result of a successful cooperation project. LARIXPRESS has proved its professionalism and experience in the field of cultural mediation. The continual exchange of ideas and punctual delivery of all components despite tight deadlines was a particularly pleasant experience for us. We now have a unique and tailor-made museum app that may be easily edited for future exhibitions. This app uses NFC technology (Near Field Communication) for orientation in the museum. All audio files in the audio guide may be activated by touching the display with the fingertips. Original music from the cantata ‘La pace di Mercurio’ and atmospheric sounds.